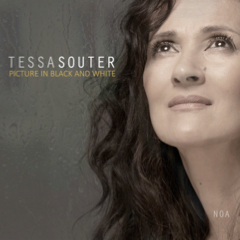 Tessa Souter's newly-released fifth album, Picture in Black and White (Noa Records) is a riveting musical journey inspired by her discovery at age 28 that her estranged birth father was Trinidadian and black, having been brought up to believe he was Spanish and white. A mixture of originals and familiar non-standards, including Wayne Shorter's 'Ana Maria' (with Tessa's lyrics, for which he granted her shared writing credit), Ornette Coleman's 'Lonely Woman' and Milton Nascimento's 'Nothing Will Be As It Was', it is an emotionally resonant invitation through music to reflect on the African diaspora experience. Hailed as "an astute and expressive singer" by Nate Chinen, in the New York Times, Tessa, a protégé of jazz vocal legend Mark Murphy, who called her a "true musician," "very moving" and "an extraordinary talent," has a distinctive and exotically beautiful style of jazz which evokes Andalusian Spain, North Africa and the Middle East, as well as the Celtic folk music she grew up listening to. Over the past two decades she has established herself as an uncommonly creative vocalist and songwriter whose artistry has taken her all over the world, including four sold out tours of the philharmonic halls of Russia and performances at SF Jazz, Dizzy's Club Coca Cola, Mezzrow, the Blue Note, Jazz Standard, Joe's Pub and the Kennedy Center Millennium Stage. She has made four critically-acclaimed albums, Listen Love (Nara, 2004), Swing Journal Gold Disc-awarded, Nights of Key Largo (Venus, 2008), Obsession (Motéma, 2009) and Beyond the Blue (Venus-Motéma, 2013), a UK Sunday Times magazine Top Ten Jazz CD of the Year, featuring an all-star band led by pianist Steve Kuhn, for which she set her own "exhilaratingly mature lyrics" (Chicago Examiner) to favorite classical melodies.